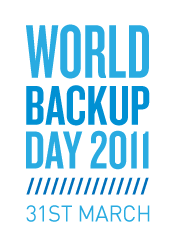 Yesterday was World Backup Day! Did you backup? I am backup obsessed. I run time machine on my MAC so it backs me up several times a day to an external hard drive. But I am even crazier. I have two hard drives and every three months I pull out the backup backup and load it to be current and then I return it to my fire proof safe. This way if there is a storm, a spill or a theft I have everything and it is only 3 months out of date. I love being overly efficient. The tall one doesn’t always love that I am so efficient but loves me when it actually does benefit him so whatever tall man! Celebrate World Backup Day – get your crap on a spare hard drive and back up your phone with a desktop manager or online service. This entry was posted in community and tagged Do This. Bookmark the permalink.